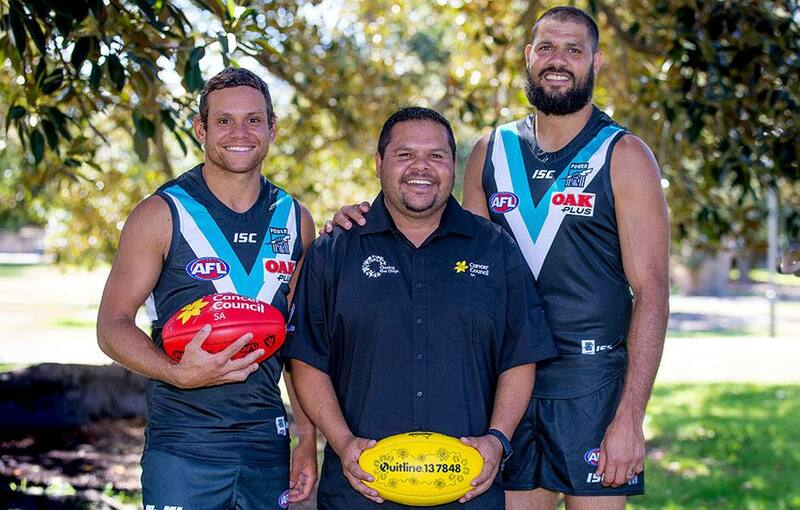 THE Port Adelaide Football Club’s Aboriginal Programs have teamed with Cancer Council SA to promote a smoke-free message to young Aboriginal people. While tobacco smoking is declining in Australia, it remains disproportionately high among Indigenous Australians. Data from the Australian Bureau of Statistics shows the proportion of non-Indigenous adult Australians who smoke has declined from 24% in 1995 to 16% in 2014-15, while in the same period the number of Indigenous Australian adults who smoke dropped from 55% to 45%, resulting in a gap of approximately 29%. With little change in the gap in smoking prevalence between the Indigenous and general populations, the Council of Australian Governments (COAG), under the National Healthcare Agreement, committed to halving the 2008 Indigenous Australian adult daily smoking rate of 47.7% by 2018—a target which has not yet been met. Port Adelaide’s Director of Aboriginal Programs, Paul Vandenbergh said he hoped a smoke-free message promoted by the Cancer Council’s federally funded Quitline would have an impact with the young Indigenous people who take part in the club’s suite of Aboriginal programs. “We know smoking is the greatest cause of disease, disability and early death among Indigenous people,” he said. “If we can prevent young Indigenous kids taking up smoking, or encourage them to give it up if they have already started, we know it’ll go a long way to closing the gap in terms of their health and life expectancy. Aboriginal and Torres Strait Islander Cancer Prevention and Programs Manager Peter Thomas said Quitline hoped to leverage off the positive social impact Power Aboriginal Programs have across South Australia and the Northern Territory, particularly in remote communities where smoking is more prevalent. “Research from Cancer Australia shows that Aboriginal and Torres Strait Islander people are almost twice as likely to be diagnosed with lung cancer compared to the general population,” he said. “Being smoke-free is important for elite sporting performance and through working with the Power Aboriginal Programs, we have a fantastic vehicle to get the message across into Aboriginal and Torres Strait Islander communities across the country. Quitline is a free phone and online support service, with trained staff that provide information and support to empower people to quit smoking. It is also a valuable resource for family, friends or health professionals involved in supporting a person trying to make changes to go smoke-free. Whether it is game day, WillPOWER, the Aboriginal Power Cup, the new Women’s Aboriginal AFL Academy or the Aboriginal AFL Academy with young men, the promotion of Quitline has the potential to reach an audience already inspired to be great and to live a healthy lifestyle. For more information contact Quitline on 13 7848 or visit www.quitlinesa.org.au.